Two thousand balloon handlers, 26 floats (accompanied by 400 float escorts), 17 giant character balloons and 3.5 million spectators will take to the streets of New York on November 23 for the Macy’s Thanksgiving Day Parade 2017. Add to that the Radio City Rockettes, countless celebrities and (of course) Santa, and you have yourself a 2.5-mile street party through Manhattan. 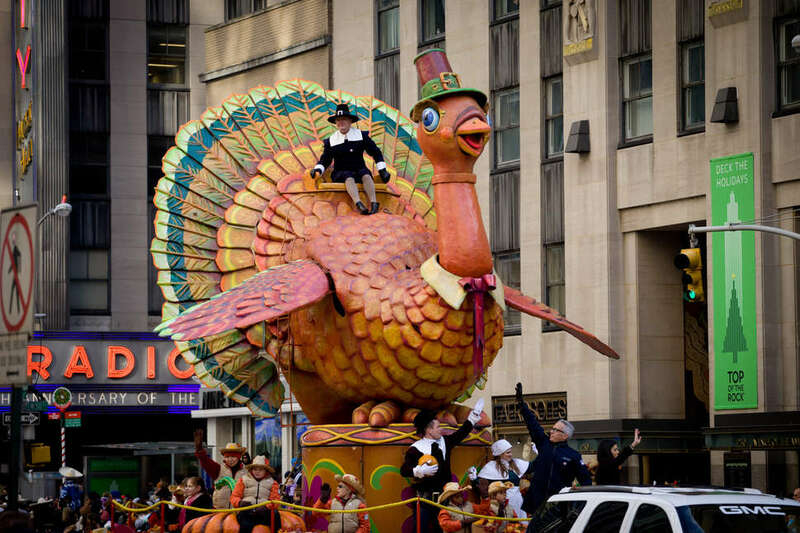 Unlike Jello-shot-fueled events like the Halloween Parade or the NYC Pride March, Macy’s Thanksgiving Day Parade is a completely free, family-friendly affair which brings out oodles of tourists, bridge-and-tunnel revelers, and New Yorkers alike. Whether you're trying to crown your NYC Thanksgiving with a TV cameo, or you’re finally ready to realize a childhood dream, here's your guide to watching the parade IRL. 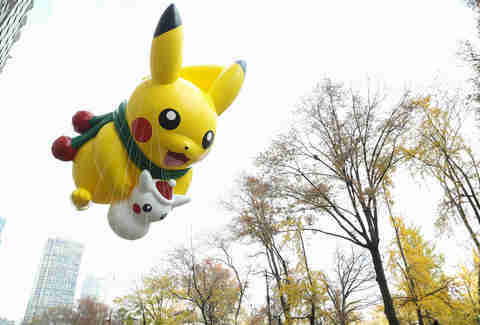 Though the parade technically kicks off on Thanksgiving morning, the shenanigans really start the evening before, when the massive balloons are ceremonially inflated outside the American Museum of Natural History. Kids, especially, adore watching as a 77-foot Power Ranger (the red one), SpongeBob, and countless more characters take shape in the sky -- so expect to have to jostle with strollers for a good view, and try not to make anyone cry. The whole thing runs from 3pm until 10pm, but visit around sunset for the optimal mix of balloon admiration, excitement at watching the actual inflation, and lingering warmth before dark. Now for the actual parade. It starts at 9am, at 77th Street and Central Park West, and finishes up around noon down at Macy’s Herald Square. Head to your preferred viewing spot well ahead of time, so, you know, you can actually see something. Like pretty much everything in New York City, you’ll want to plan on taking the MTA rather than a taxi, as many streets will be closed before, during and after the parade. The parade runs down Central Park West to 59th Street, then turns south on Sixth Avenue and eventually back west onto 34th Street. If you’ve ever been to a ground-level event in this chaotic metropolis, you know the best place to view it is from above. Should you not have friends living along the route, try Tinder or Craigslist, or coerce an invite out of a long-lost college pal. No connections? Consider booking a room at the New York Hilton Midtown (parade-facing rooms start at $599) or the Courtyard By Marriott Herald Square (parade-facing rooms start at $569), or any of the other hotels on the route that can ensure street views or rooftop access. Plus room service, of course. 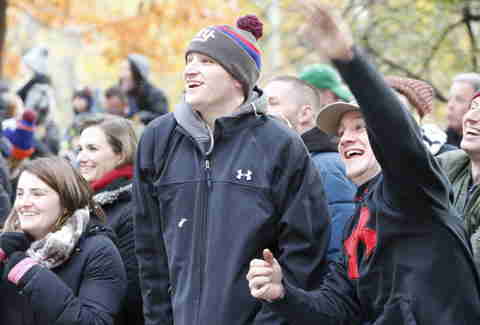 If you don’t want to splash your cash, head to Central Park West and 75th Street (the northernmost blocks have reserved grandstand seating) around 7am to beat some of the crowds and escape the madness of Midtown. Don't rely on having cell service, and agree a place to meet if/when you get separated from your group. Many people will tell you the Time Warner Center at Columbus Circle is their preferred indoor viewing spot. Trouble is, they all go there, so it’s tough to find a spot by the window. Lastly, a sneaky alternative: find someone whose office is along the parade route, and ask them if they have access to their building on Thanksgiving Day. Anything that will help you stay warm on a morning forecast to be just a few degrees above freezing. Unpack that Canada Goose, cut the tags off those earmuffs you planned to regift next month, and stash a few poppable hand warmers in your pockets. Wear layers (so you can strip one off should the heat of the crowds warm you up), and bring a blanket to sit on or wrap around your shivering shoulders. Pack snacks (enough to keep you going until the feast later on), a warm drink, and a backup phone battery. Leave large backpacks at home (for space and security reasons), and yes, beware of pickpockets. This day is more about eating than anything else, so plan your meal(s) accordingly. On the route itself, Quality Italian, Kingside and Oceana are among many restaurants offering special Thanksgiving meals after the parade ends. You could also head down to Avenue B, where Old Monk will be serving a free India-inspired Thanksgiving buffet (turkey meatballs in curry sauce! cranberry chutney!) to all patrons from 12pm to 3pm. Alternatively, make a reservation at one of our top picks for Thanksgiving dinner, to save yourself from learning how to cook for one more year. Melissa is a writer based in NYC. Thanksgiving is her favorite holiday. Follow her on Twitter and Instagram.